While doing the 50 Tips presentation at Convergence, my co-presenter, Pam Misialek, repeatedly pointed me away from the drop down menus and to the home page for navigation. With the emphasis being placed on this from Microsoft, I'm working on changing the way I work so that I can better help you. In Microsoft Dynamics GP 2010, We can get this error. When it comes to securing metrics on GP 10's homepage, very little can be found outside of KB articles 918313 and 914898. But a few of us have decided to put this issue to rest -- I say a few of us because this 'how to' guide could not be possible without the assistance of FlieHigh and Tim Foster of Trudell Medical Limited in London, Ontario, Canada, both regular contributors in the Microsoft Dynamics GP community -- by combining our different approaches on the subject. Lets get started! There are two approaches to lock down the metrics for a particular user in GP. 1) Open Query Analyzer (SQL 2000) or SQL Server Management Studio (SQL 2005). Execute the following statement against the DYNAMICS database. How do I get rid of this annoying reminder at start-up? First, click on it to open the item. How to change GP 10.0 Homepage?? Enables users to view a report and drill thru to the Microsoft Dynamics GP 2010 form that contains the actual record. So you want to be able to startup GP with a navigation bar option instead of the typical home page? This request was posted today by Mary Fetsch on the Microsoft Dynamics GP community public newsgroup. After playing around with the navigation bar for a while and some head scratching, the light bulb went off... use a macro! 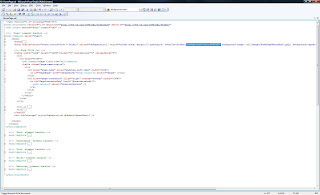 One peculiarity about the navigation bar is, while click actions are off limits to the macro system -- the navigation bar is part of the .NET managed code application wrapper -- each option can be accessed with a combination of the Control key on the keyboard and a numeric sequence associated to the option. 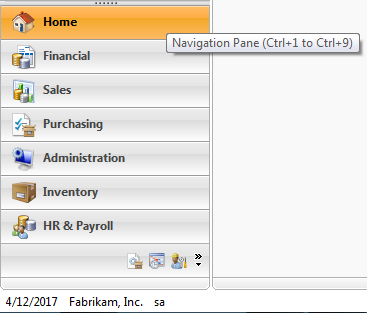 As such, Home can be accessed with the CTRL+1 keyboard combination; Financial, with the CTRL+2 combination, and so on. I just started working on implementing certain key graphs for the Management Team. The first and foremost tryst was GP10 Home Page Metrics and if it does not cater for our requirements, I thought I would look out for external tools and developments.